At the same time J&G were taking turns wearing a police helmet fashioned with an indian headdress and using the shaft of a plastic golf club stripped down to be a baton and trying to bend over backwards and touch the feathers to the ground like the Drum Major of TBDBITL. It was quite a site and the laughing and boys falling all over made it hard to read my daily Bible verses. We had the whole morning to hang out at home with no practices, no sports to run to, no commitments at all. SHEW a breath, finally. So I headed into the basement to try and find my poker table through the mound of LEGOs... I spent quite a bit of time sorting time sorting the various pieces by type and size into their respective bins. Can you say OCD??? 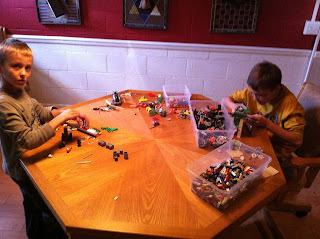 The boys took a interest in the LEGOs and started building new things as fast as I could put them away... We took several breaks for foosball games where I successfully defended my title against all three boys. L&G headed out with Nicole Sam & Lena to go see their Grandparents then on to Hudson's third birthday to see Suzanne, Hudson and Noelle (from the Suz-Mae blog). DJ&I stayed home and finished the great LEGO cleanup and then I started on the back half of the basement as the boys kept building... Jack built this guy sitting on a couch watching a big screen TV. We all took a break and watched the very exciting ending to the Michigan Illinois game into triple overtime!!! 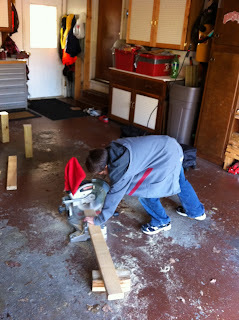 Then D&I headed out into the garage to build a stand for the new dryer. I showed D how to figure out how high the legs should be based on the measurements he took from his mother and the dryer and the size the base needed to be. He did all of the cutting and most of the assembly. 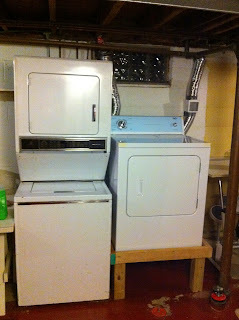 We carried it down to the basement and got the dryer up and on the pedestal, wired up and vent installed. I would say he did a fine job! 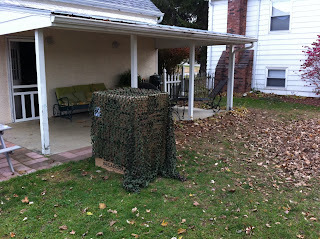 We got everything cleaned up and were done by 7pm. The three of us loaded into the car and went to Panda Express and had a good Chinese meal and fun. 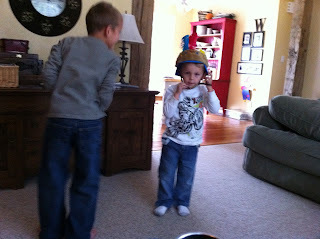 We then hit Meijer to get some supplies and home to meet up with L&G and hear of their adventurous day. We watched some football and got the boys to bed. Up late watching movies and updating the blog.